Why is Your Girl a Scout? You should answer: “Because Scouting is inspiring–It is is constructive. It is definite–It is democratic–It is elastic–It is practical–It is Fun. Some say she should get this in her own home–but does she? You cannnot supply her with jolly chums as a working unit. You cannot give her merit badges to wear on her home nursing, cooking, and child nursing. In Atlanta 500 Scouts are laying the foundation of that knowledge which every father and mother would rather give their daughters than anything else in the world. You want a fair and square “Play the Game Girl.” You cannot preach it. Girl Scouts teach it to one another. Team play, give and take in friendly competition (under trained leaders), gives a schooling for life that was never so much needed as now. When you see a girl in a Scout uniform do not look on her as a faddist or something military. 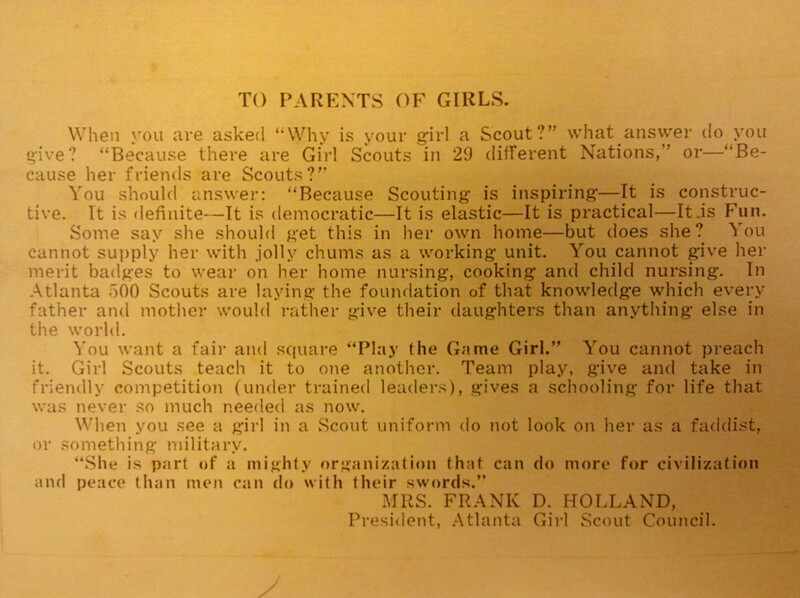 This clipping is from her collection in the Girl Scouts of Greater Atlanta Archives. After turning the reins over to Mrs. Albert Adams, Mrs. Holland continued at Camp Civitania (now Camp Timber Ridge) as “camp chief.” Three years later, the council made her “honorary commissioner for life” at the suggestion of Mrs. Arthur Harris, a member of the national board of the Girl Scouts of the USA. Posted on June 27, 2011, in Council History and tagged Camp Civitania, Camp Timber Ridge, collection. Bookmark the permalink. Leave a comment.